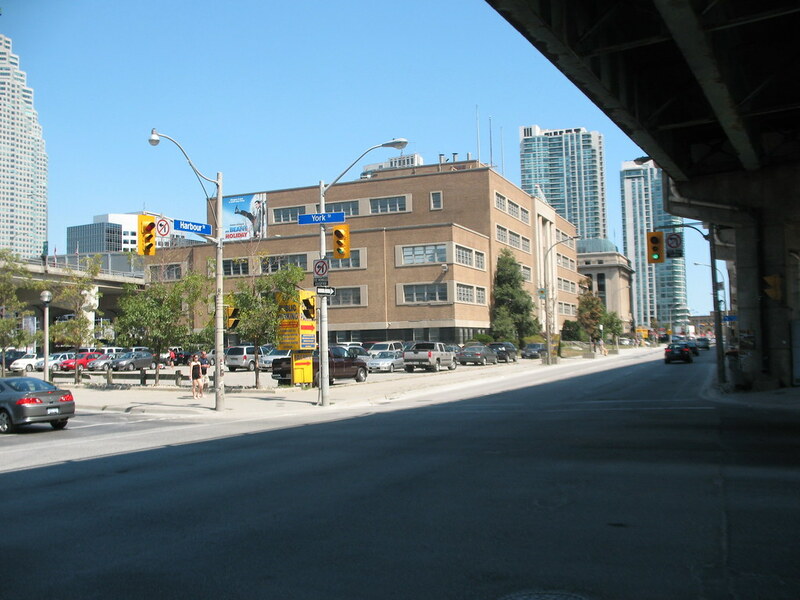 The longstanding idea of moving Toronto's intercity coach terminal to Union Station from its existing location at Bay and Dundas Sts. could finally be realized under Ontario's new regional transportation planning body. "I think it's worth the GTTA looking to see whether there's a viable proposal that can be made," chair Rob MacIsaac said yesterday. "We'll talk to all the players and the private sector and see what the possibilities are." A GTTA report recommends the transit authority â€“ created by the province to develop an integrated transportation plan for Greater Toronto â€“ take the lead in incorporating an intercity bus terminal into the Union Station hub. It also suggests the GTTA signal interest in the Harbour St. property, just south of the Gardiner, before the site is eaten up by burgeoning residential and commercial development. A bus terminal "could further enhance Union Station as a major inter-regional mobility hub," according to the report. The study would consider how intercity bus service would work with other regional transit programs, Union Station redevelopment and Toronto's vision of reconnecting the waterfront with the downtown business district. Private coach operators are "ecstatic" about the idea, according to the head of the Ontario Motor Coach Association. The existing terminal, which hasn't been significantly updated since 1984, is dismal, he said. "Passengers have to drag their bags across Elizabeth St. to get into the main part of the terminal." Operators have dreamed of moving out since about 1995, when the TTC flirted with the idea of selling its Bay St. building, Crow said. The association investigated moving the terminal into the old CP freight sheds, but that space was given to GO Transit. The GTTA study would consider governance and ownership issues of a new terminal, but Crow said the coach operators would be pleased if the property was owned by the city's Toronto Economic Development Corp. and leased to them. One way or another, Toronto will be getting a new intercity bus station. Senior Toronto Transit Commission officials say they would be delighted to see the existing station moved, but if it stays where it is in a TTC-owned building at Bay and Dundas Sts., the commission would probably modernize it. Chair Adam Giambrone said he has no objections to a potential plan being studied by the Greater Toronto Transportation Authority to move the terminal to a site south of Union Station. In fact, "we'd be thrilled," said Giambrone, who also sits on the GTTA board. The GTTA wants to signal an interest in 90 Harbour St. â€“ formerly OPP headquarters â€“ before the province sells it off to a developer. A coach terminal near the lakeshore could support Union Station's role as a regional transportation hub, according to a report that goes before the GTTA board tomorrow. It would probably be linked to the station by a covered walkway that would guide passengers into downtown's PATH tunnel system. Coach operators like the idea of a move because being closer to the Gardiner Expressway would cut arrival times. The TTC has already studied the possibility of renovating the existing station. "But how much do you spend?" wonders Giambrone, given that "none of the carriers are willing to put any money into it." The idea of moving the terminal has been kicking around since at least the mid-1990s. If the GTTA finally prompts a move, at least the TTC would be able to move forward with the Bay St. property, said TTC general secretary Vincent Rodo. The two-storey, historically designated building could be redeveloped, but probably not for TTC use, freeing up money to provide other services. If the terminal stays, some kind of reconfiguration would be part of a modernization. Newer buses are longer than they were when the terminal was built, which means they tend to overhang their bays, Rodo said. Also, coach operators say buses are constantly being ticketed because there isn't enough room for them to park. Few passengers use the designated walkway and instead drag their bags across the street that separates the arrivals and departures areas. The GTTA was created by Queen's Park to come up with an integrated transportation plan for the Toronto-Hamilton region by 2008. Anyone have a photo of the old OPP headquarters? The location is to far from Union and the lands on the east side of Bay street next to the tracks is a good location and would have to be 2 to 3 level building with a new LRT loop underground. Looking west from Bay St at the building to be torn down to make room for new bus terminal as well the old OPP and Toronto Harbor Commission building Sept 2-07. Parking lot should be bought at the same time for future expansion. Did you say they are planning to tear down the Harbour Commission Building?! That would be really stupid! I think the building he's saying would be torn down is that brown/tan building that's in the foreground of the third picture (the one with the Mr. Bean movie ad on it) which I think is the Old OPP Headquarters. Correct and I find that odd since it work well in the area. The Harbor building is going no where. The lot to the east was my impression for the location of the terminal when first announced until I saw the layout at the GTTA meeting. Use the whole block as a transit hub and will have room to grow. I can't decide whether that old OPP HQ building should be saved or not in my opinion. I took the GO bus downtown today, and the building really isn't that special driving by it. Is it historical? Maybe if we tore it down we would end up regretting it 50 years down the road. Could we use the building 'as is' as a bus terminal? Before OPP Headquarters, it was the Workers' Compensation Board HQ, built in 1953. Never knew that. The city has just decided to withdraw its application for giving the building heritage status - it has no authority, it being owned by the Ontario Reality Corporation. The cultural heritage value of the property at 90 Harbour Street is related to its design or physical value as a representative example of a mid-20th century office building that blends features of the three prevalent styles of the period. While the symmetry, cladding and profile reflect Modern Classical styling, the stepped plan and vertical elements recall the Art Deco and the band windows are identified with the Art Moderne. All three styles were introduced in the 1920s and remained popular until the International Style or Modern Movement gained acceptance in the 1960s. The abandoned building is owned by the Province - used to be the former OPP head offices. The Province has done a study of potential development options including a mix of condos/office, including incorporating a new bus terminal. I think the bus terminal option is dead. Description: The property at 90 Harbour Street is worthy of inclusion on the City of Toronto Inventory of Heritage Properties for its cultural heritage value or interest. Located on the northeast corner of Harbour Street and York Street, the construction of the Workmenâ€™s Compensation Board Building began in 1950 and was completed in 1953 according to the designs of George N. Williams, chief architect and deputy minister of public works for the Province of Ontario. After the Workmenâ€™s Compensation Board (now known as the Workplace Health and Safety Board) vacated the premises, the complex served as the headquarters of the Ontario Provincial Police from 1975 until 1989. Statement of Cultural Heritage Value: The cultural heritage value of the property at 90 Harbour Street is related to its design or physical value as a representative example of a mid-20th century office building that blends features of the three prevalent styles of the period. While the symmetry, cladding and profile reflect Modern Classical styling, the stepped plan and vertical elements recall the Art Deco and the band windows are identified with the Art Moderne. All three styles were introduced in the 1920s and remained popular until the International Style or Modern Movement gained acceptance in the 1960s. The cultural heritage value of the Workmenâ€™s Compensation Board Building is also connected to its contextual value as it supports the evolving character of the Central Waterfront as the location of government edifices. 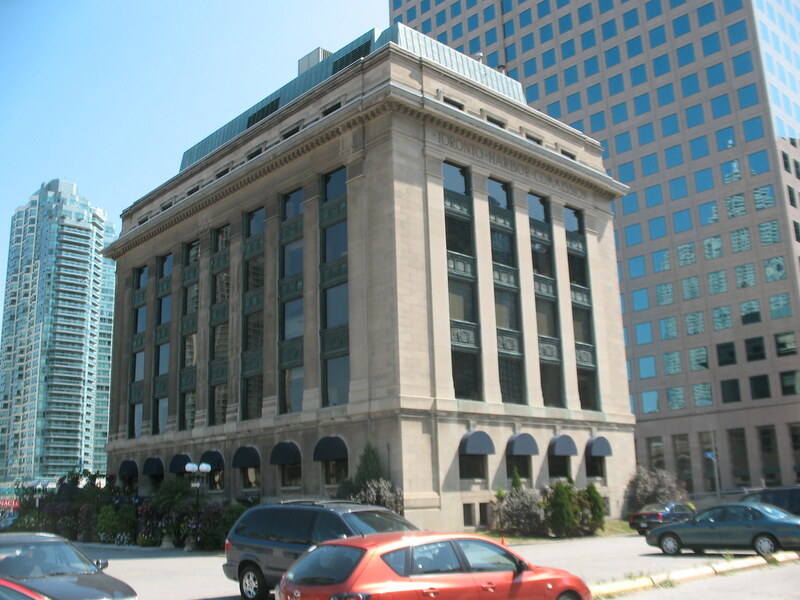 The Toronto Harbour Commission Building (1917) at 60 Harbour Street, which adjoins the subject property, and the neighbouring LCBO Headquarters and Warehouse (c. 1947) at 55 Lake Shore Boulevard East are recognized on the City of Toronto Inventory of Heritage Properties. Heritage Attributes: The heritage attributes of the property at 90 Harbour Street, related to its cultural heritage value as a representative example of a mid-20th century office building blending aspects of the prevalent styles of the period, are found on the exterior walls and the roofs, with particular attention to the principal (south) faÃ§ade of the main block, and on the interior as described below. The building is organized in three parts where a five-storey central block is flanked on the east and west by three-storey wings. Above a base clad with polished black granite and ashlar limestone contains window openings, the elevations are faced with buff brick and trimmed with limestone. On the centre block, the principal (south) faÃ§ade is organized into three bays by a monumental stone frontispiece that rises five stories. The frontispiece, composed of a stone surround with an outer framework of piers and a cornice, is divided into three sections by two angled piers. The main entrance is placed at the base of the frontispiece where three sets of doors with sidelights and an oversized transom are recessed beneath a canopy. Within the frontispiece, single flat-headed window openings are placed on either side of the entry and in trios above it. The vertical thrust of the frontispiece is balanced by the horizontal lines of the strip windows in the outer bays of the centre block. The strip windows are set in stone surrounds and contain metal sash windows. The pattern of the fenestration continues on the east and west elevations of the centre block. Its rear (north) wall features similar detailing, apart from the flat piers that divide the frontispiece. The east and west wings repeat the pattern and appearance of the fenestration introduced on the centre block. A cornerstone at the southeast corner of the building reads â€œThe Workmenâ€™s Compensation Board 1951.â€ Limestone coping trims the flat roofs covering the centre block and wings. On the interior of the centre block, the first-floor entrance vestibule and elevator lobby with its patterned aluminum elevator doors, terrazzo floor, and marble-faced walls and baseboards is an important feature. The remaining interiors, including the first-floor cafeteria with its Art Moderne elements and the elevator lobbies on the upper floors, have been documented but are not included in the Reasons for Listing. I hope it's something more than just condos.